All Serendipity Software products have a built-in Archives application to help back-up any saved database configurations. It is highly recommended that a backup is performed after first installation and periodically to avoid any data loss in the event of a hardware or software malfunction. 1. It is assumed the Server and Client are both running and there are saved configurations in the Workbench. 2. 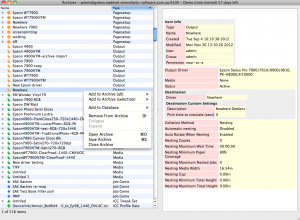 Go to the Applications menu > Archives to open the application. 3. Once open, go to the Archives window, right-click and select Add to Archive (all) > Everything. This will load all currently saved configurations into the Archives window and may take a few minutes depending on how many items it is loading. 4. Once the items have loaded select File > Save Archive and save the archive file in a safe location. 5. To set automatic backups go to File > Automatic Backup Preferences. 6. 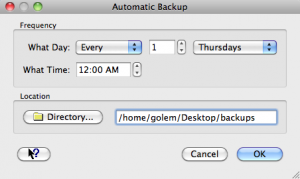 Select the relevant day and time for the automatic backup to be scheduled. A location to save the file will also need to be configured. 7. Click OK and close the Archives application when finished. This entry was posted in Applications, Blackmagic, HowTo, Megarip, Veripress. Bookmark the permalink.